Refer a sponsor to run a drive event on your behalf and receive 5% of its total donation value as a cash gift from YouGiveGoods. 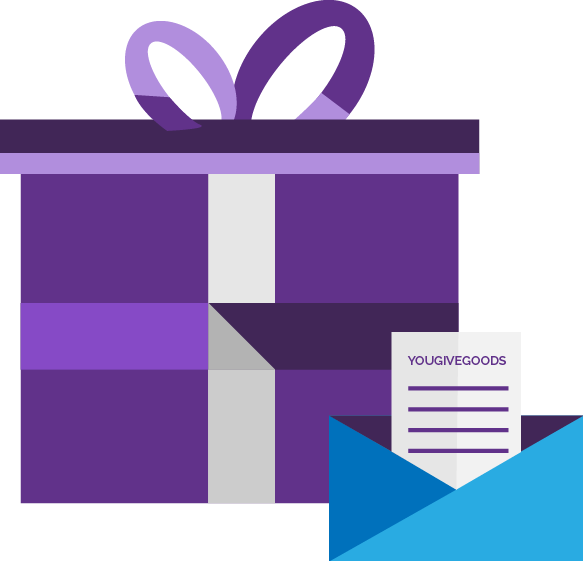 The YouGiveGoods Charity Referral Program is part of our ongoing initiative to strengthen resources for charities everywhere. We believe that greater support means greater community impact. *NOTE: Referral Program gift payments may be processed sooner than quarterly upon agreement between YouGiveGoods and Charity Partner. YouGiveGoods will serve as the accounting system of record. Please provide a valid tax identification number. Charity must register with YouGiveGoods as a Charity Partner to be eligible for the referral fee. Applies only to drives created on the YouGiveGoods giving platform. Drive must be started by a Sponsor directly referred by the Charity Partner. Charity Partner must submit qualifying Referral Program drives to YouGiveGoods prior to the drive start date. YouGiveGoods will provide a cash gift to the charity equaling 5% of the total dollar value of the donations for drives that meet our Charity Referral eligibility requirements. Referral Program cash gifts are in addition to any Give-Backs during YouGiveGoods and Corporate Giving Days. Referral Program cash gifts will be made within 30 days after the end of each fiscal quarter based on the donations made for eligible drives in the previous quarter*.